In this second part of translating Chapter 4 of Classic of Tea, I am working on items 2 to 9 listed by Lu Yu. As I translate, I cannot help but compare these items to our modern day Gongfu Cha tea set, I feel that the utensils used by Lu Yu is more elaborate but very cleverly constructed. Lu Yu’s 2nd item, “ju” (筥) is essentially a bamboo basket, possibly with rattan on the outside, which was used for holding coals. Lu Yu’s ju had a height of 1 “chi” (尺. 1 chi is 33.3cm) and 2 “cun” (寸. 2 cun is 6.6cm) and a diameter of 7 cun (23cm). It had a smooth lid made of wood. The 3rd item is “tan zhua” (炭挝), an hexagonal metal rod for breaking pieces of coal. It was 1 chi in length, and had a sharp pointy end, a thicker middle and a thinner handle end. The handle end might be decorated with various items attached. One: Origin 一之源:- This chapter expounds the mythological origins of tea in China. It also contains a horticultural description of the tea plant and its proper planting as well as some etymological speculation. Two: Tools 二之具 (Part 1) & (Part 2):- This chapter describes 16 tools for picking, steaming, pressing, drying and storage of tea leaves and cake. Three: Making 三之造:- This chapter details the recommended procedures for the production of tea cake. Four: Utensils 四之器 (Part I), (Part II) & (Part III):- This chapter describes twenty five items used in the brewing and drinking of tea. Five: Boiling 五之煮:- This chapter enumerates the guidelines for the proper preparation of tea. Six: Drinking 六之飲:- This chapter describes the various properties of tea, the history of tea drinking and the various types of tea known in 8th century China. 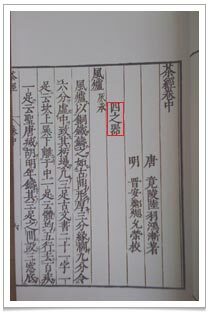 Seven: History 七之事:- This chapter gives various anecdotes about the history of tea in Chinese records, from Shennong through the Tang dynasty. Eight: Growing Regions 八之出:- This chapter ranks the eight tea producing regions in China. Nine: Simplify 九之略:- This chapter lists those procedures that may be omitted and under what circumstances. Ten: Pictorial 十之圖:- This chapter consists of four silk scrolls that provide an abbreviated version of the previous nine chapters. “Huo jia” (火筴) is the 4th item listed by Lu Yu. It was a pair of fire tongs fashioned from round iron or copper rods. The two rods, which operated rather like chopsticks, were 1 chi and 3 cun long (43.2cm) and were held together at one end with decorations. The next item is “fu” (鍑) which is a little, unlidded, cast iron pot. The fu was used to boil water on the feng lu (风炉) (a wind furnace. See Lu Yu: Classic of Tea Chapter 4 (Part I) blog post). Lu Yu says that he had old broken unused farm tools melted down to make the pot. In order to make it, he filled a mould with sandy soil before pouring on the molten iron. When the iron pot was formed in the mould, he would smear the interior of the pot with mud. It made the interior easier to clean and the exterior more heat absorbent when the pot was finished in the oven. Lu Yu goes on to describe the pot or fu in yet greater detail. It had two square handles, making it look proper and straight. However, it also had a wide opening which would allow any powdery tea leaves to spread out inside the pot. But the pot should have a tall middle (Lu Yu uses the term “long navel”) to allow the water to boil in the middle of the pot. That way, any tea powder would float to the top, adding to the mellowness and sweetness of the tea. 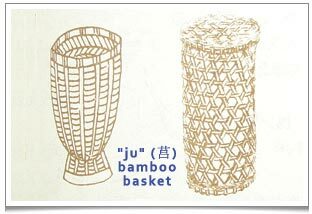 A “ju” (筥) is a bamboo basket used for holding coals. Lu Yu then says that in “Hong Zhou” (洪州. now in the Nanchang area), people like to use a porcelain pot as a fu while people in “Lai Zhou” (莱州. now the Sandong area) use a stone pot. Lu Yu says that both are considered refined crockery rather than durable or sturdy. A silver pot, he says, is distinctive, refined and clean, but much too extravagant. While not as refined or clean, the cast iron pot is the most durable. I find it fascinating to read Lu Yu’s account of how cast iron utensils were made in those long gone days. Also to learn little historical details, such as how in those days tea was brewed by simply being boiled. Indeed, this was known as the “boiled” tea era. (The other two eras are the “whipped” tea era and the current “steeped” tea era). The 6th item is the “jiao chuang” (交床), a foldable, cross-legged table. The table top had a round hole in which one could place a pot of boiling tea. Lu Yu did not say what this table was actually used for, but further research on the matter indicates that, after boiling tea in the feng lu (wind furnace), the fu was put on this table to undergo a “still” boiling process, allowing the tea time basically to cool down. 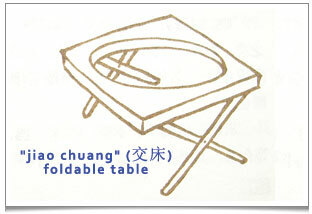 A “jiao chuang” (交床) is a foldable table with a round hole in which one could place a pot of boiling tea. 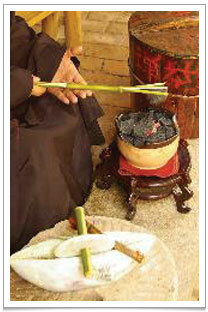 “Jia” (夹), a pair of tongs made from green bamboo is Lu Yu’s 7th item. It is 1 chi and 2 cun (40cm) long. About 1 cun from one end is a segment of bamboo from where it is split to the other end. The split ends can then be used to hold a piece of tea cake over an open flame. The natural fragrance of the bamboo is absorbed by the tea cake thereby improving its flavour. Lu Yu says that unless you are roasting tea in the deep forest, it is rather hard to find this kind of green bamboo. Tongs made of iron or wrought copper are more durable. A piece of tea cake being toasted on a open fire;- can you imagine the fragrance that permeates the air! At the bottom of the picture is a stone Nian for grinding the tea. The 8th item is a “zhi nang” (纸囊). This is paper made from rattan, a famous product from “Shan” (剡) (now called “Sheng” (嵊)) county in the east of Zhejiang province, part of Shaoxing city (where we get the famous Shaoxing cooking wine). It is extremely white, refined yet pliable and good for holding just-roasted pieces of tea cake. Wrapping the tea cakes in this paper serves to prevent their glorious aroma from escaping. This must be the favourite item in Lu Yu’s descriptions, the idea of wrapping pieces of warm toasted tea cakes in handmade paper really shows the tea master’s care for the tea. “Nian” (碾) is the 9th piece of apparatus in this chapter. Lu Yu says that nian is best made from the wood of the mandarin orange tree. It can also be made from pear wood, mulberry wood, paulownia timber or the Tricuspid Cudrania tree. Nian is rectangular, which makes it stable, but has a curved hollow inside which fits a roller just nicely. The roller has a spindle in the middle. The spindle is 9 cun (30cm) long and 1.7 cun (5.6cm) wide. The roller itself has a diameter of 3.8 cun (12.5cm) and is 1 cun (3.3cm) thick in the middle but only a half cun (1.6cm) thick at the edges. The spindle is rectangular in the middle but more round towards the ends. From Lu Yu’s description, we can infer that a nian is used as a sort of pestle and mortar with the nian being the mortar albeit in a rectangular shape. Unlike the pestle that we know, we have a roller that crushed the tea cakes in the rectangular mortar. Lu Yu says he uses a feather as a brush to remove any tea powder residue left on the nian, from which we can infer that pieces of tea cake, first toasted slightly on an open flame, would then have been broken into the nian before boiling in the fu to make tea. Any leftover pieces toasted tea cakes would be wrapped in the “zhi nang” paper to kept the wonderful aroma from escaping. 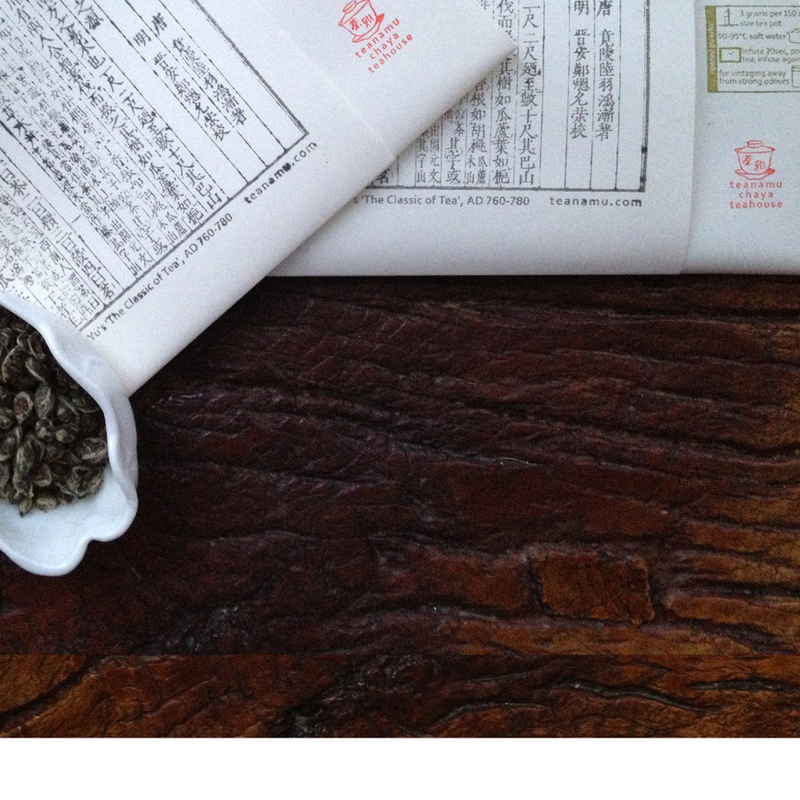 Again, we can notice the influence of ancient,Tang dynasty tea drinking habits on the subsequent Japanese tea culture – notably the fact that, evidently, the idea of drinking of powdered green tea was taken to Japan in precisely this era. On to the next post where I will be translating the next set of items listed in Chapter 4. In the mean time, have a fabulous August bank holiday weekend!